Lexi Sundell is an artist who paints dramatic luminous flowers and also designs and creates contemporary jewelry in precious metals. Her artwork can be viewed at RiverStone Gallery, which she and her husband own and operate in Ennis, Montana. Her artwork and writing is published in a limited edition leather bound coffee table book titled Flowers of the Dawn: Paintings and Poetry. She is the author of Painting Acrylic Flowers A-Z, published by North Light Books here in North America, Search Press in the UK, and Simon and Schuster in Australia. The book also was translated and published in French and German. Lexi created a major painting section for Acrylic Secrets: 300 Tips and Techniques for Painting the Easy Way published by Reader’s Digest. Her painting “Orchid at Midnight” won a juror’s choice award in the prestigious international competition, Blossom: The Art of the Flower, sponsored by the Susan Kathleen Black Foundation. Another painting, “When a Flower Dreams” received honorable mention in Blossom 2. Her work was shown in Avante-Garden at the Torpedo Art Factory and numerous museums. Lexi’s artwork also has appeared in newspapers and magazines. 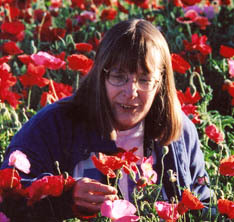 She gardens extensively in the difficult Montana climate, creating massive explosions of poppies while filling a large hoophouse with tomatoes every summer. Her gardens are a joyful interactive collaboration with nature and provide most of the material for her paintings. Lexi is co-founder and teacher of Crystalline Consciousness Technique™ and continues to evolve the process in her own work. She currently teaches workshops combing those energy processes with painting. The newest class is Earth Healing: What Are You Here To Do? More information about this Earth healing watercolor class is on the Art Energies website. Energies of Creation is a collection of articles exploring creative living in Montana. Adventures with the nature realm, art as a fundamental expression of life, and energy processes which facilitate conscious evolution all are included here. One of the processes frequently used in these explorations is Crystalline Consciousness Technique™, a cutting edge holographic process which accelerates intention with great power. Effective use of CCT requires high awareness of intention and develops the ability to distill intention to the core meaning, which in turn results in direct and powerful manifestation.